Wow, feels like a while since I posted an outfit, huh? I've been busy with work lately, and since the apartment doesn't have wi-fi, I've kind of neglected blogging. Oops! I won a giveaway for a giftcard to Lulus, which is so exciting since they're one of my favorite online stores! These two beauties arrived a few days ago, and I can't stop wearing them! This striped dress is so pretty, and I adore the high low hem. Plus, a tribal print backpack? You can't not love that! I know it's going to be getting a lot of love for the next semester. They were meant to be paired together in my opinion. Its an odd print mixing combination, but with some tribal wedges, I think the backpack blended in. It just works in a weird way. So for these photos, I decided to kick up some dust and walk among some orchards. Mom and I had explored this spot before, only this time, a guy interrupted our photo session. He walked up, did a bit of double take when he saw me, and asked if we needed any help. I bashfully explained that no, we were just getting some "Senior photos" (always the simplest excuse when people wander into a blog photoshoot). We asked if we could stay, and he was fine with it. As I cautiously walked in my tall wedges, he added, "Be careful!" before he wandered off. Man, these run ins with the public during photos are so awkward! In other news, I just have to say that I'm enjoying being a little homemaker for our apartment. Haha, it looks sooo much better, girls. I've been hitting the thrift store every couple of days and managed to find these nice little knick knacks and decoration items that perk up the place. I'll have to do a tour of it soon, but it's still in the works. Congratulations on your giveaway win! This dress looks awesome on you! I love your shoes and backpack with it. Glad everything is going well Linda. You look great! Yeah having people come up is super awkward. Love what you picked out! I love that dress! You are looking stunning as always! Cute outfit! You are rocking those stripes! Love the shoes! I wish my lifestyle called for a need of more than one backpack... Hmph. LOVE yours. I think this works so well because the stripes on every piece compliment each other. Well done, miss lady! I always love b/w, this dress is awesome on you!!! Wow, I absolutely love the clash of prints and the statement striped dress- it looks great on you! Such a fun look. Great use of stripes with the dress and shoes, mixing it up. Very cool. That 3rd shot is especially wow. Missed you on my blog recently. If you get the chance come visit sometimes. You are always one of my favorite guest. What are "senior pictures?" maybe I can yell that when people give me weird looks as they see me walking around with my tripod, haha! Your wedges are adorable! And I'm obsessed with your hunger games necklace! loving the ethnic print on the wedges and backpack!!! perfect with the backdrop! I LOVE that dress. I'm not a huge hi-low fan, but I would scoop that dress up in hot minute! And congrats on your upgrade to an iPhone - I am by no means a electronic gizmo person, but I covet my iPhone. You'll have so much fun with it. love these photos! haha yes its always a tad awkward when people come across you when your taking photos, i can just feel them judging me hahaha! Ah amazing! I love this head to toe, that dress is amazing and those shoes are to die for! love love loved that dress! I must agree, the wedges, dress, and backpack together create the perfect combinations. I'm in love with those wedges! Ahh, the awkward moments when the public intervenes with photo shoots. I can't even tell you how many times that's happened to me. Haha! LOVING that dress and those wedges - you look so cute! this outfit is so summer chic!! the backdrop goes well with it :) LOVE the whole vibe of this ensemble!!! that stripe dress is so nice!! we already started school here. and the rainy season too. Summer is over i guess. LOL oh gosh oh gosh Linda I totally use the "senior photos" excuse, too, even though I graduated two years ago... and you one year ago! We're awesome. Phew, finally, your outfit. ;D I loooove that stripe-y dress! Stripes will never get old. And the asymmetrical hemline is such a super fun touch. && also oh gosh, your comment was so sweet! (how many times have I said "oh gosh" so far in this comment? far too many) I don't think you're one of those "shallow" bloggers, for lack of a better term (I'm definitely not saying that people who don't post anything about themselves are, because for all we know, they may just be playing it safe on the internet or something!). I know so much about your family, your heritage, and your amazing self, so there's no way you could ever be one of those chicks who just posts an outfit and is done with it. :) You totally have thoughts and ideas behind yours pretty pictures, my sweet darling! It's so cute that your mom helps you take pictures. I love this beautiful dress, so perfect for summer, and love the location of the shoot! how can you be s lucky Linda? Honestly I'm envious, haha. Love that bag. i actually almost got a similar one from Forever21,... and yeah totally agree with photo taking in public. but you'll get used to the stares and weird reactions.. i know i have haha. Lindaaa! You are seriously so cute. Is that a Hunger Games necklace? I just swooned. But seriously. I love that cool high-low dress and it looks stunning with your stylish wedges! Can't forget that awesome trendy backpack! I seriously love that senior photos excuse. And I can actually use it because I'll be a senior! I am so satisfied right now haha. This dress is amazing, what a great giveaway to win! Stripes look so good on you, and I love the mix of it with the tribal backpack. Is that your mom taking pictures of you? Oh my, I can only dream about it. Its realy awesome! Beautiful pictures and the outfit! Nice post, well done! Your backpack is just the cutest! I love it with the stripes! Awesome awesome dress - I just wore one with a high-low hem on my blog today, too :)) Also, I have a tribal print backpack in a really similar style and I love it - it's a perfect alternative to a purse sometimes, isn't it? Great look and blog! Lets follow each other? Kisses. Stripes and tribal print?!?! LINDA! I love you and this fantastic combo! You look gorgeous, lady! Oh, and I'm absolutely obsessed with your hair in a hot cross bun:) Plus, this photo location is gorgeous! I hate the awkwardness that is someone walking in on a blogging shoot, but I'm totally stealing your GENIUS idea of telling people it's a senior shoot! That really is brilliant. Although I am 24, people constantly ask me if I'm still in high school, so this works perfectly:) One bonus of looking like I'm 16 I guess. Yay for getting an iPhone! I've got a weird obsession with iPhone cases so you should definitely devote a post to them:) Looking forward to it! Hehehehe I like that 'excuse' I may have to fashion it for my own purposes for style posts! The 'senior' thing wouldn't work for me here in Oz! That dress is amazing <3 The sunglasses compliment is so well! Lovely outfit too! I am amazed that you can walk around there with Wedges :)! you look gorgeous I love the fish tail on you something I cannot wear! Love your necklace too is it a Hunger Games one? 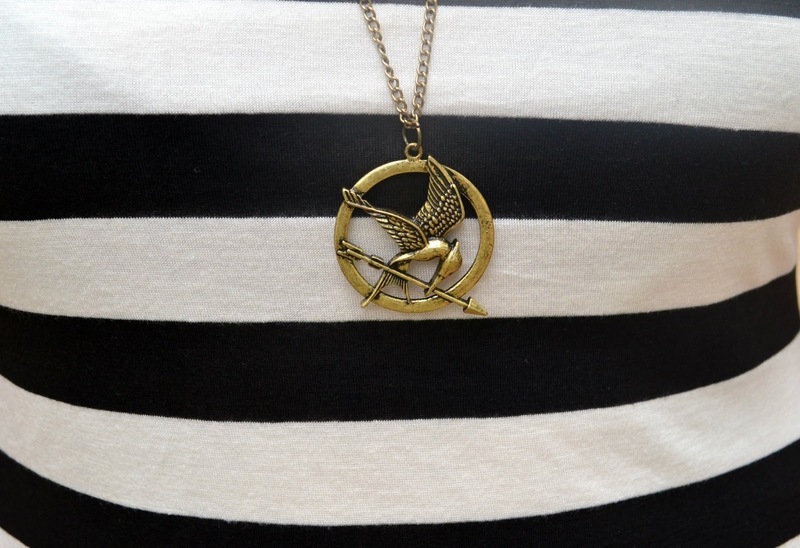 The hunger games necklace is brilliant! I adore this outfit, so summery but unfortunately it's not warm enough here in the UK for me to wear anything like it :( boo! I'm new to this blogging business and would really appreciate it if you'd check out my blog and leave any feedback! loving the hi lo hemline and tribal bag! FAB SHOTS! Love the dress! You look so great, love it. Also, I really need to go to the thrift store for decorating items! That is the best place!! He actually said "be careful"?? :) That's funny. And adorable. And funny. :D Congrats on winning the gift card, I LOVE this dress you got! I like this setting and your toe nails in white look so cool. this dress is too cute! loving the stripes, first of all...and then those shoes! Yeah, those interruptions just never get any better. It always feels so awkward but at least you had your mom with you, it's when its just you and the tripod that it gets awkward trying to explain yourself. I love these crazy heels, they do look a little dangerous though! The whole series of pictures are so pretty, the landscape around you is gorgeous! Ah!! YAY for winning a giveaway..that's awesome!! I love the wedges paired with a white pedicure....I would never have thought of doing that!! But it really helps the tribal print stand out!